Since the start of school break, I've been thinking of home activities I can do with the kids. As you know, I'm a stay-at-home mom to two precocious youngsters and summer time can be more stressful when they're at home most days. Normally, during vacation time, I assign days for summer classes, field trips, and home-based projects - which is actually harder to plan. 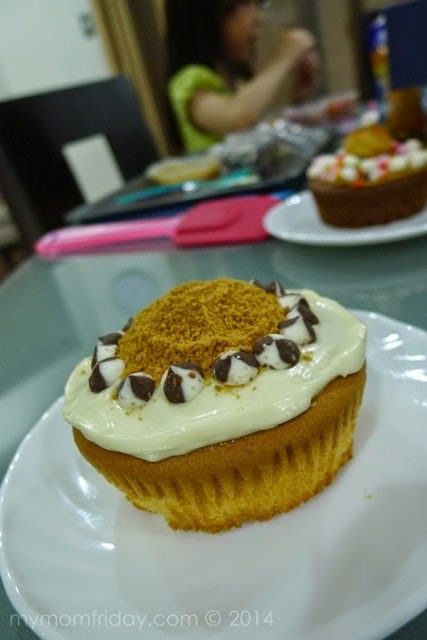 We just do the usual arts and crafts, and have a kitchen day to experiment or bake. I also welcome invitations to interesting events where my kids can participate - saving me a day of thinking what to do with them, hahahaha! 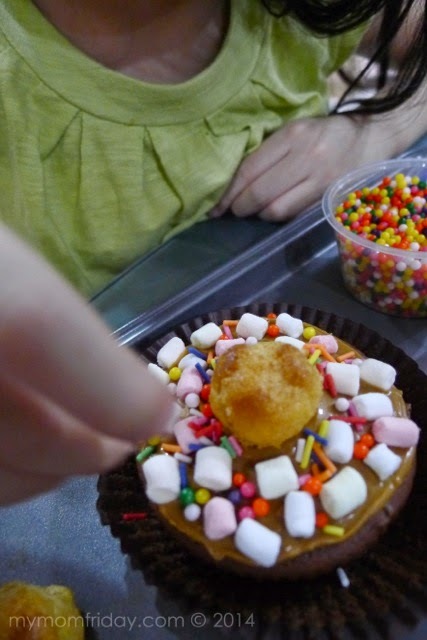 Speaking of events, we sorely missed the Mamon-It-Yourself (MIY) party for moms and kids last month, with lots of eating and mamon-decorating (mamon: like a soft mini sponge cake). 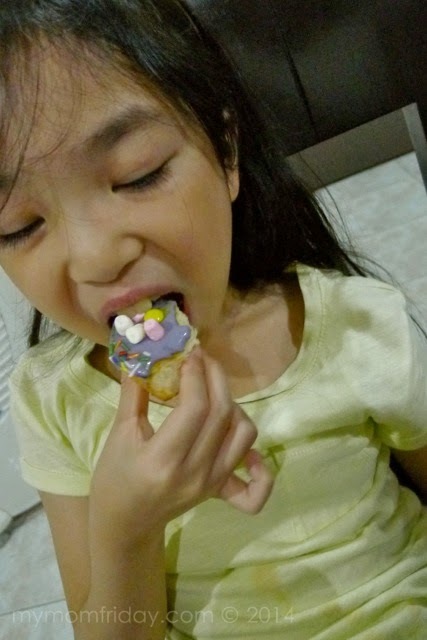 I was so inggit with my friends who shared photos of their mamon creations with their children. 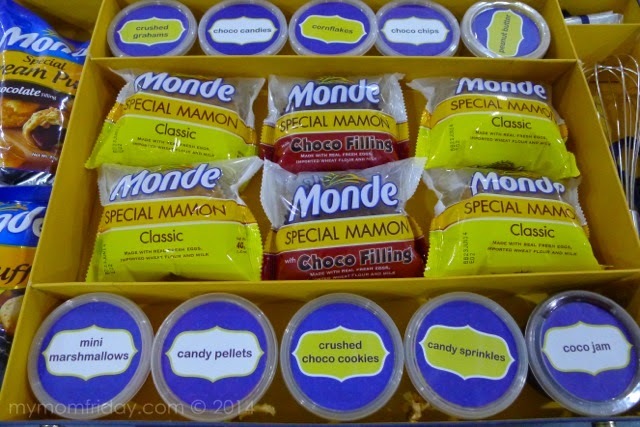 I usually buy Monde Special Mamon classic and mocha for my kids to bring as snack (baon) to school, so I thought we can just do something similar. The unboxing began immediately when we saw the huge blue carry-all kit. 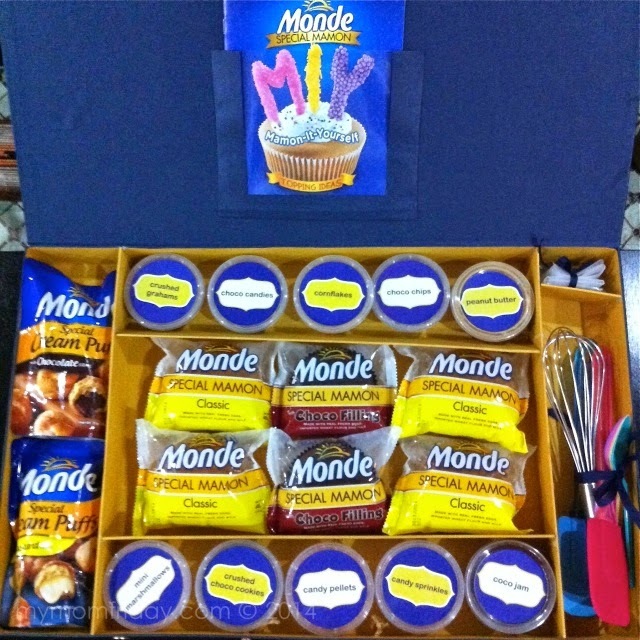 Look what's inside this MIY box: 6 Monde Special Mamon, complete with an assortment of toppings, including the Monde cream puffs, MIY recipe booklet, and a set of decorating tools. Here are the products up close. 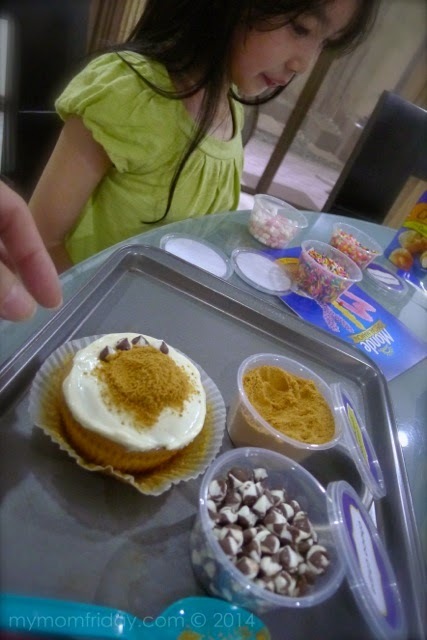 My girl immediately spotted her fave candy pellets and mini mallows and sequestered them. The day after we got the MIY kit, we made our own decorating "recipe". It was easy-peasy! We just used what we have in the pantry. 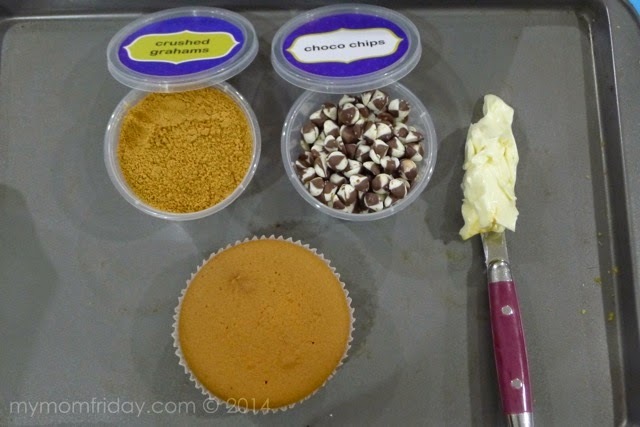 Pipe out frosting, or spread your choice of "icing"
It's that simple. 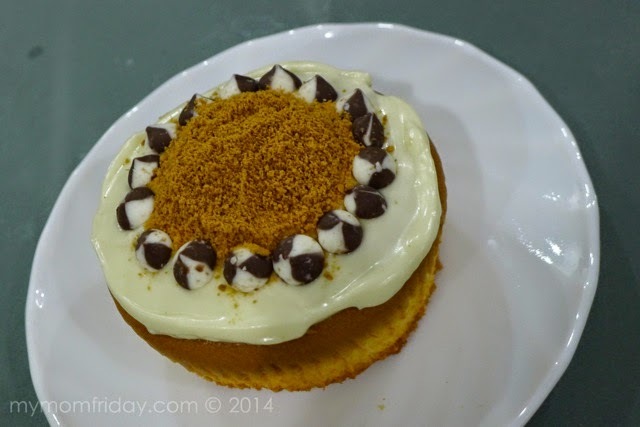 Check out our Mamon-It-Yourself creations below. 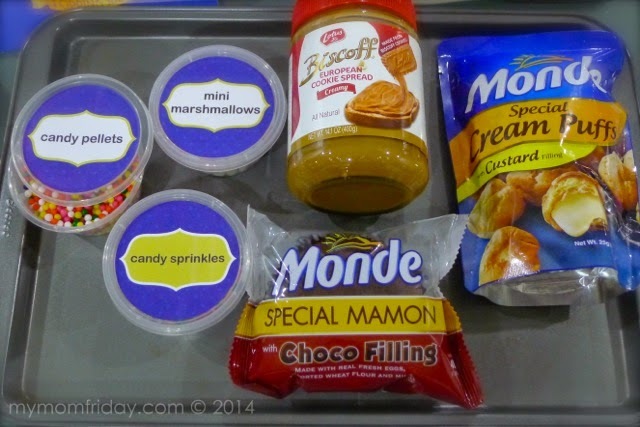 Anything with Biscoff spread is tasty - a nice match to the mamon. I think using the classic mamon would be much better. 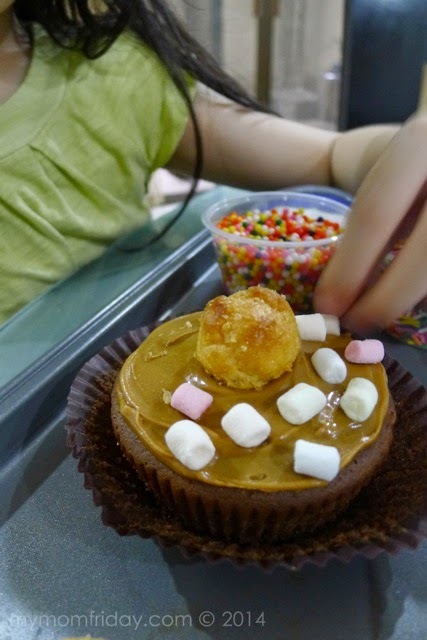 The crisp custard cream puff was a perfect compliment! We actually prepared two colors, but mine did not turn out as a cute Mr. Sun, hahahaha! So, we just shared and ate it immediately so we can move on to her purple garden. 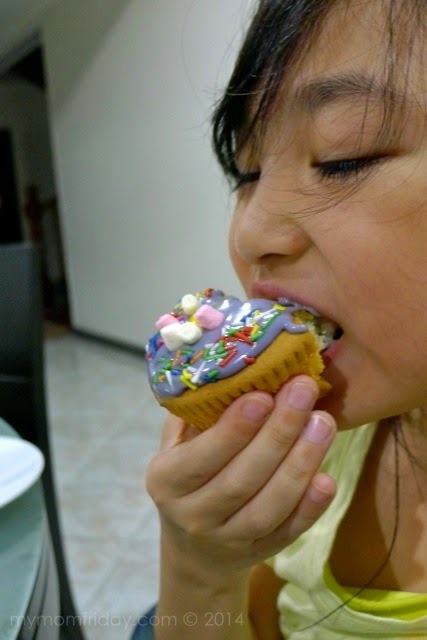 M snapped a pic of me while taking a bite, and insisted I include my not-so-flattering photo beside hers. 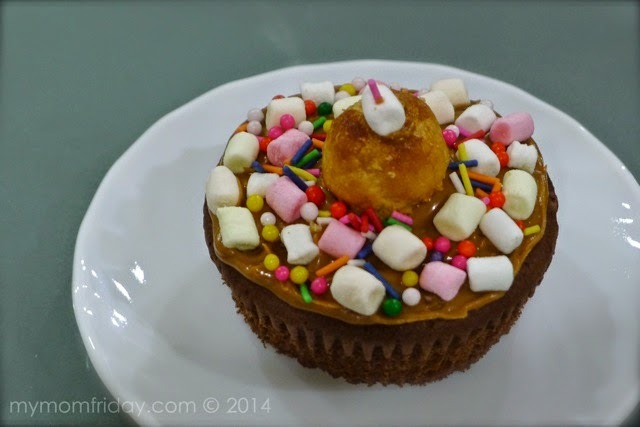 Summer break or not, anyone can Mamon-It-Yourself anytime with fluffy Monde Special Mamon. You can even have MIY parties at home! 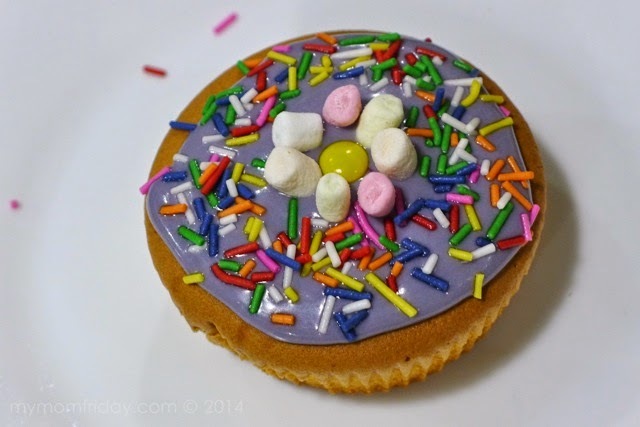 The mamon tastes good on it's own, so the toppings make it extra special. 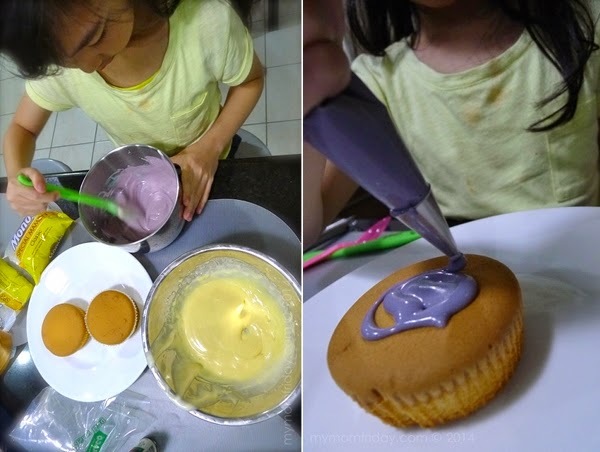 If your kids are like mine, they can also eat the sponge-y soft mamon and the toppings separately when they tire of decorating, heehee! Mommies, daddies, grannies, kids, go try this at home! I swear, mag-e-enjoy kayo! 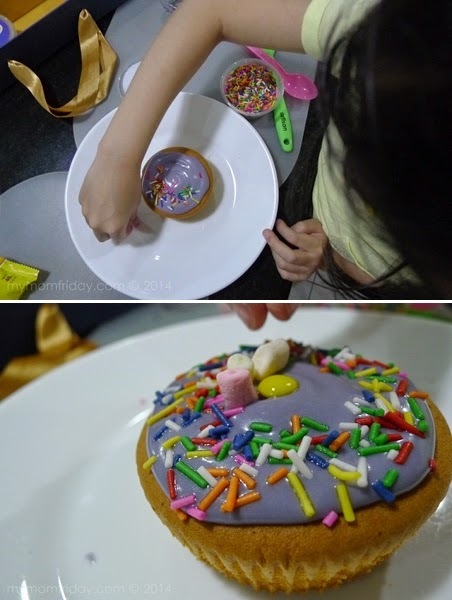 MIY is a deliciously sweet and messy kind of summer bonding activity with family and friends. 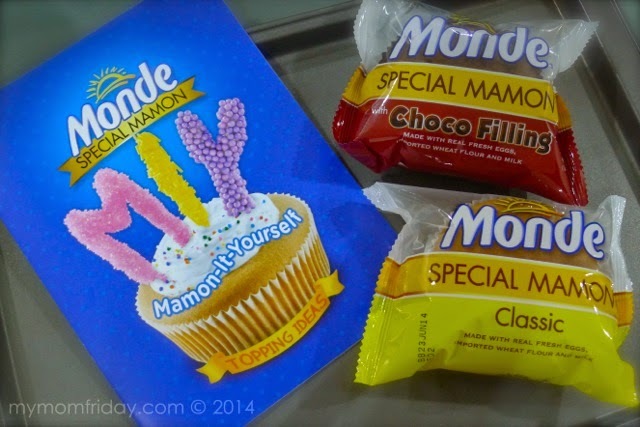 Plus, Monde Special Mamon is made with fresh and premium ingredients: real fresh eggs, imported wheat flour, and milk. Do share your creations and hashtag #MamonItYourself when you upload on Instagram or Twitter. Have an MIY day! Enjoy the rest of summer!